They say it takes a village to raise a family. From our experience last week at The Inn at Castle Hill, something similar goes into creating an outstanding meal. 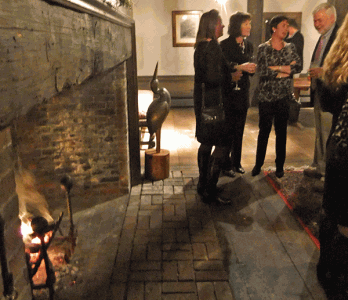 We were invited to a special chef’s dinner at this charming spot in Ipswich. Just down the hill from the Crane Estate, both are run by the Trustees of Reservations, and profits from the meal ($125 per person) went to the Trustees. Cocktails in front of a welcome fire in the tavern. The chef in this case was Robert Grant, chef de cuisine at The Butcher Shop, one of Barbara Lynch’s many Boston eateries. So it was perhaps no surprise that one of the passed hors d’oeuvres, served in the inn’s cozy tavern, was pied de cochon. What was interesting was how fantastic this cube of pork goodness was, and we later learned from the chef that it was topped with mustard imported from Menton, France, the inspiration for Lynch’s newest restaurant. The other pork offering, salt pork bacon on a sourdough toast also had an interesting topper: a sprinkling of madeira-glazed chestnuts. The non-meat offerings were just as delicious, including a spoonful of butternut squash risotto and a square of puff pastry topped with honey and caramelized onions. Grant decided to make the risotto after seeing the gorgeous squash that afternoon at Appleton Farms, a Trustees operation a few miles from the inn. After the cocktail hour, which included an open bar, we moved from the tavern to the inn’s well-appointed dining room. 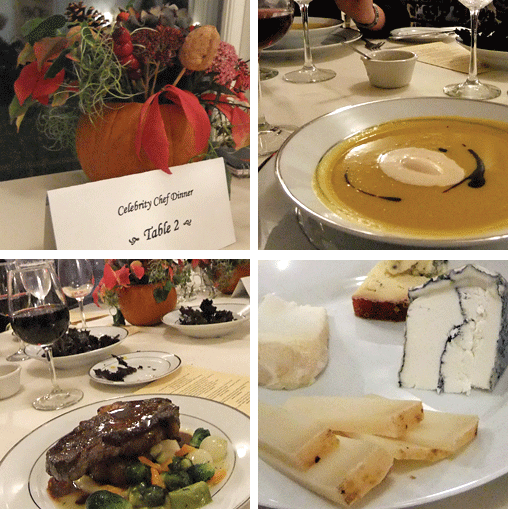 Along with the first wine of the meal, a pinot noir from Rodney Strong, we were served brioche and sourdough bread, crispy kale, and a potage of Long Island Cheese pumpkin. The soup was hot, creamy, and swirled with luscious pumpkin-seed oil from Austria. Instead of butter, we spread the bread with outstanding honey from Champlain Valley Apiaries. 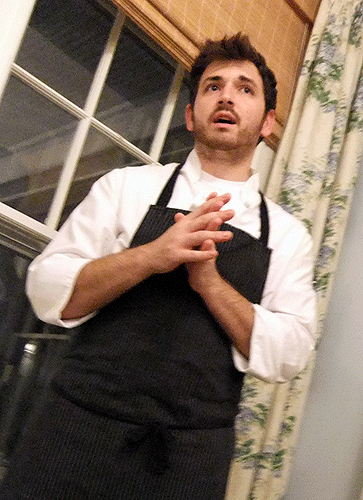 Chef Robert Grant discusses the meal. The main course of rib eye steak from Appleton Farms was served with a wonderful parsnip puree, delectable baby vegetables from Appleton, and a dolcetto d’alba from Acheri. The rib of the steak had been braised on the bone and was heart-stoppingly tender and flavorful. The t-bone was cooked to a lovely pink but was very dense, a texture we attribute to its grass-fed nature. Continuing to play on his strengths, Chef Grant ended with a cheese course rather than a sweet one. He brought along Stephanie Santos, cheese buyer for Menton, who described the four cheeses we sampled. There was a fruity Brebis Pardou from France, a mild Toma Tre Latte from Italy, a Lake’s Edge goat’s milk with ash center from Blue Ledge Farm in Vermont, and a Stichelton from England. The latter was a rare treat: the flavor of stilton but more creamy and with less bite. As a final surprise, the cheese course was paired not with wine but with a glass of crisp Midas Touch ale from Dogfish Head. We thoroughly enjoyed the evening, which combined good company (foodies of all ages), great food, abundant wine, and locally sourced products with a wealth of information from Grant and Santos, who fielded questions about ingredients and cooking methods with knowledge and patience. More information about the next dinner of the series (now in its third year), featuring Sam Hunt from 15 Walnut in Hamilton on December 2, is here.